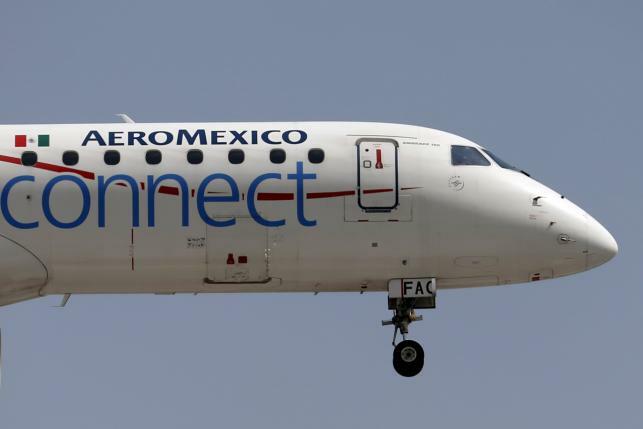 (P1) Mexico’s largest airline, Grupo Aeromexico, is at the center of a PRICE AND MARKET-FIXING INVESTIGATION being led by the country’s competition authority, which CONDUCTED a DAWN RAID on the airline’s head office earlier this year. (P2) Competition regulator Cofece has asked Aeromexico for information about its agreements with other airlines, sources said. (P3) Reuters could not VERIFY with which companies Aeromexico might be SUSPECTED of having COLLUDED. The carrier is part of the SkyTeam Alliance, has numerous CODE-SHARING AGREEMENTS, and is currently trying to get APPROVAL for an ANTITRUST EXEMPTION for a JOINT VENTURE with Delta Air Lines, which owns a small STAKE in the Mexican CARRIER. (P4) The U.S. Department of Justice has launched a similar but separate investigation into whether U.S. airlines have worked together illegally to keep airfares high. (P5) The Mexican investigation could serve as a TEST CASE for the country’s new COMPETITION LAW, which AIMS to break up heavily CONCENTRATED SECTORS such as banking, telecommunications, and transport. It also means that ALLIANCES between airlines are being PUT UNDER A MICROSCOPE. (P6) Earlier this year, officials from Cofece TURNED UP at Aeromexico’s Mexico City headquarters without PRIOR warning as part of the investigation. The investigators were there until early the next morning making copies of documents and hard drives to take away. (P7) A spokesman for Aeromexico DECLINED to answer questions about the investigation and referred to a company FILING after Cofece’s April announcement in which it said it would COOPERATE with authorities. (P8) Cofece said in April it was looking into “absolute MONOPOLISTIC practices” in the transportation of passengers and or CARGO, but it did not name the TARGETS of the PROBE. The raid on Aeromexico is the only one so far in the investigation. (P9) Companies found to be colluding can be fined up to 10 percent of income, have directors BANNED for up to five years or jailed for up to 10, according to Mexico’s new competition law. (P10) If Aeromexico and Delta win U.S. and Mexican IMMUNITY from antitrust regulations for their joint venture, it would allow passengers to RESERVE, buy, and fly INTERCHANGEABLY between them, according to a March filing. (P11) Delta owns a 4.17-percent stake in Aeromexico, and its President Ed Bastian sits on both BOARDS OF DIRECTORS. (P12) The three other larger local air carriers are Interjet, Volaris, and Vivaaerobus. Aeromexico also has a codeshare agreement with regional carrier Aeromar. (P13) Volaris Chief Executive Enrique Beltranena said on a CONFERENCE CALL in April that Volaris was not part of the investigation. (P14) A spokeswoman for Vivaaerobus said that the company was cooperating with the investigation. Interjet declined to comment, and Aeromar did not return a request for comment. (P15) Investigators do not need a judge-signed WARRANT to carry out raids in Mexico, just “OBJECTIVE cause” that there could be collusion, though the UNANNOUNCED visits are later subject to JUDICIAL REVIEW. (P16) The Aeromexico visit was one of the first under the new competition law passed in 2014, which some lawyers have described as among the toughest in the world. Why do most countries have laws against competing businesses colluding on pricing and other market issues? What is your preferred airline to fly on? Are there multiple air carriers in your country, or only one major airline? Why are international business agreements legally complicated?